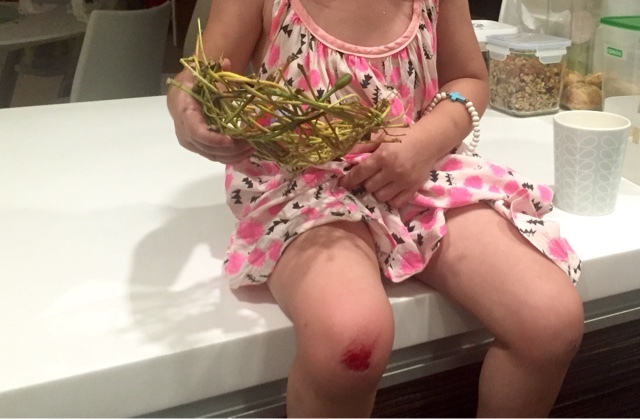 mummywee: How do you respond when your child falls? How do you respond when your child falls? Kate's teacher related an incident at school, and commented that she is very brave. She had accidentally dropped a toy on her toe and it bled. She winced but did not burst into tears. Her teacher noticed that whenever she falls, she would just pick herself up, and asked me if that was because she was the 6th child. Tough and resilient. I think how a child reacts has a lot to do with the way the adults respond. Kate was a few months old when our helper, Mary, came. Every time she fell, I don't know who shrieked louder. The child or the helper. Sometimes, Mary's loud scream scared her even more than the fall itself. Mary would run over, pick her up and sayang (pacify) her effusively. I told her not to do that as her response only served to make her cry even louder so that she will be showered with more attention. Thinking back, my mum had an even more ridiculous response when the kids fell and cried. Once, one of the older kids knocked her head against the side of the table and cried uncontrollably. When all soothing words failed, my mum tried to distract her by hitting the table loudly saying, "Naughty table! You hurt my little girl." Grandma and toddler ended up hitting the table repeatedly together, scolding it for her mishap. As that response worked to stop the child from crying, my mum would do that whenever any of them fell and cried. Be it the floor that was naughty, the door, or some poor innocent toy. I can still picture in my mind's eye many a ridiculous scene with grandma and toddler admonishing some inanimate object. With Kate, I have stopped my mum from doing that and explained that it will teach her to adopt a blaming or victim mentality. I got hurt, it's your fault. Always somebody else's fault. The hubs, on the other hand, has his own method of dealing with it. He would try to console them for say, 10 seconds, but if they continue to sob, his patience would run out. "That's enough. You're a big girl/boy. Stop crying. It's just a little cut." And that was that. They would have to get on with it, no matter how much it hurt. It might stem their crying quite quickly, but it is not very healthy for them emotionally as they will bottle everything inside. My teens and I were having a good laugh recently when they read something off social media. When a child falls, the caucasian mum will go, "Honey are you alright?" Followed by hugs and kisses. I've had a lot of practice dealing with their scrapes and scratches, and with Kate, I'm now as cool as a cucumber. She was running in the mall and fell face forward on the ground. The s-p-l-a-t kind of fall. The adults around her gasped and waited for the wail to follow and the rush of hands to grab her up. For 3 seconds, no one moved. Kate looked at me, and I gave her my yes, I know you can pick yourself up look. She got up, dusted herself and came to me for a big hug. I asked her quietly "Does it hurt?" She nodded, and because her hurt was acknowledged, she didn't need to cry loudly to make it known. "Where is the pain?" She pointed to the few places where she hit the ground. I kissed her to make it better and she was as good as new. The adults looked at me and smiled. Seriously. They stood there and watched the whole 'show'. I guess the bigger lesson for them to learn is that even if in future, they fail or fall, they will be able to pick themselves up.